Mindfulness has always been the ultimate tool for growth, happiness, and success. Learn essential techniques and instructions on how to reveal your innate treasure of wisdom and compassion by Ven. Khenpo Tsewang Dongyal Rinpoche, Tibetan Buddhist master of meditation and mindfulness. Participate in our silent auction that will feature many special items and services that will raise funds to complete the new Yeshe Tsogyal Temple at 419 East Iris Drive in Nashville’s Berry Hill. Auction begins at 6pm, closing at 8:30pm. 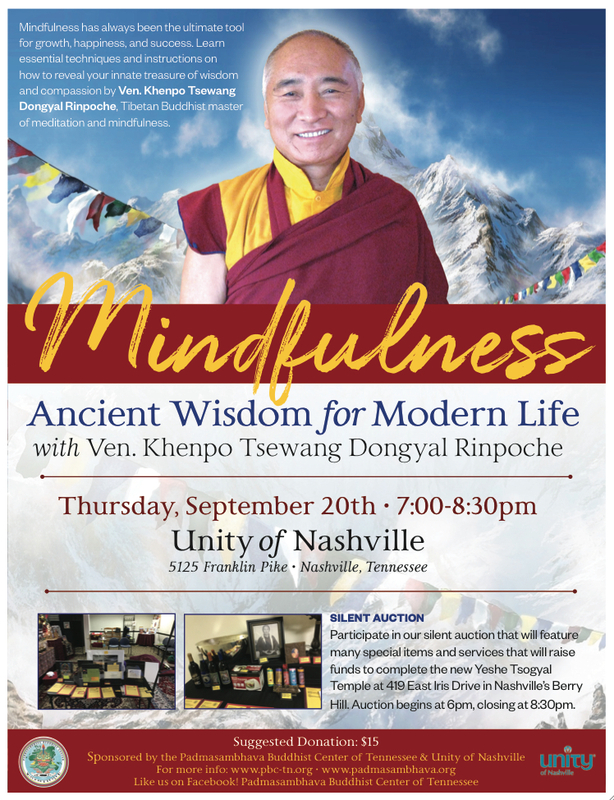 As a holder of the complete Buddhist Nyingma lineage of study and practice—from the basic teachings of mindfulness to the most advanced meditation techniques of Dzogchen—Khenpo Tsewang Rinpoche is a regular visiting lecturer at Unity of Nashville. He has an amazing ability to communicate profound topics in simple words, touching people’s hearts and opening their minds to their wisdom and compassion. He is the author of many learned works in Tibetan, and has co-authored over 30 Dharma books in English with his brother Khenchen Palden Sherab Rinpoche. Khenpo Tsewang Rinpoche travels extensively within the U.S.A. and throughout the world, giving empowerments, teachings, and guiding students with personal advice.